The 31st annual Oregon Mock Trial state competition was fiercely competitive this year, with sixteen high school teams traveling from as far away as Baker City to hold trials at the Mark O. Hatfield Courthouse in downtown Portland. Two days and three rounds winnowed the competition down to two finalists: St. Mary’s Academy (Portland) and Lakeridge High School. Village Home Education Resource Center came in third, and the fourth-place saw a rare tie between was Portland’s Grant High School and Catlin Gabel School. First place was decided in a winner-take-all final round, with the teams flipping a coin to decide who would represent the plaintiff (Lakeridge) and the defense (St. Mary’s). The Honorable Michael Simon of the U.S. District Court presided. Joining him were Ms. Nkenge Harmon Johnson, President & CEO Urban League of Portland and Mr. Peter Richter, partner at Miller Nash Graham & Dunn. The students tried a fictional criminal case – Landry Lopez v. Buddie’s Burgers – which deals with important issues like whistleblowing, retaliation, and peer relationships. After a two-hour long final trial, St. Mary’s was victorious, with Lakeridge coming in second. 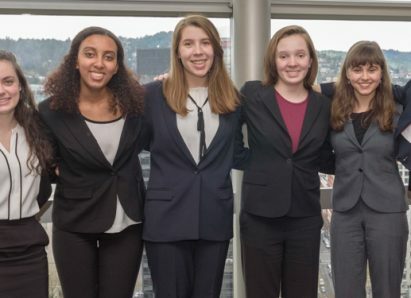 The St. Mary’s team will now represent Oregon at the National High School Mock Trial Competition in Hartford, Connecticut, May 11 – 13. Started in 1983, Classroom Law Project brings vital and engaging civics and law-related education programs into Oregon schools, teaching students the values and skills essential to being a participating citizen in our democracy. Each year, CLP’s innovative and timely programs inspire nearly 900 teachers and 63,000 students statewide.